The trades industries are some of the largest sectors for employment in Australia, and a qualification from Victoria University Polytechnic can help you get your foot in the door. Our programs span the full trades offer across construction, electrical, plumbing and furniture. You will hone your skills through hands-on learning, taught by teachers who hold industry relevant qualifications. To ensure you have the most up to date skills you will learn in our multi-million dollar trades facilities at our Sunshine campus. This state-of-the-art training facility boasts high-tech labs and dynamic workshops with the latest machinery and technologies. The Construction Hub’s computer work stations give students access to discipline specific software for simulation, modelling and experimental analysis. Our apprenticeship students work on real-world projects with their employers and on campus. Campus projects can be small-scale activities or part of larger programs, such as our full-scale Live Works transportable homes. Find out more about Live Works transportable homes. 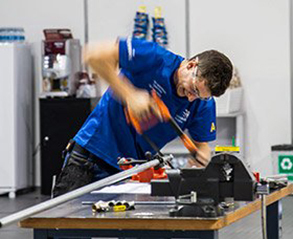 Plumber Dylan Di Martino proved he is one of the world’s best young apprentices, winning a bronze medal at the International WorldSkills championships.